1. High priest from 174 to 171 B.C. ; brother of the high priest Onias III. During the absence of Onias, who had been summoned to Antioch to meet charges brought against him by the Hellenists, Jason joined hands with his brother's enemies. Through the payment of large sums he obtained from Antiochus the transfer of the high-priesthood, permission to erect at Jerusalem a gymnasium and an ephebeum, and the grant to the inhabitants of Jerusalem of the privileges and title of citizens of Antioch; for the latter favor alone he paid 150 talents.During the three years of Jason's administration the influences of Hellenism in Judea reached their climax. In his desire to pass for a Hellene Jason went so far as to send representatives to a duplication of the Olympian games celebrated in the presence of Antiochus at Tyre, and presented 300 drachmasfor a sacrifice to Hercules, to whom the games were dedicated. But notwithstanding his zeal Jason was deposed at the end of the third year, having been outbid by Menelaus, supported by the Tobiads. Jason, however, did not consider himself defeated; profiting by the absence of Antiochus Epiphanes, then engaged in a war with Egypt, and backed by the majority of the inhabitants, he rendered himself master of the city, and compelled his adversary to seek refuge in the fortress. Jason's triumph was short-lived. Antiochus, forced by the Romans to abandon his campaign against Egypt, seized the opportunity afforded by Jason's uprising to march against Jerusalem. 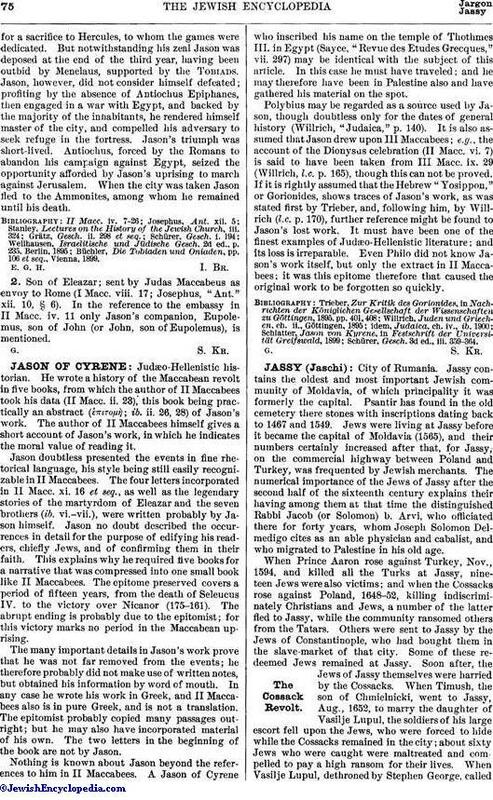 When the city was taken Jason fled to the Ammonites, among whom he remained until his death.Bibliography: II Macc. iv. 7-26; Josephus, Ant. xii. 5; Stanley, Lectures on the History of the Jewish Church, iii. 324; Grätz, Gesch. ii. 298 et seq. ; Schürer, Gesch. i. 194; Wellhausen, Israelitische und Jüdische Gesch. 2d ed., p. 235, Berlin, 1895; Büchler, Die Tobiaden und Oniaden, pp. 106 et seq., Vienna, 1899.E. G. H. I. Br. 2. Son of Eleazar; sent by Judas Maccabeus as envoy to Rome (I Macc. viii. 17; Josephus, "Ant." xii. 10, § 6). In the reference to the embassy in II Macc. iv. 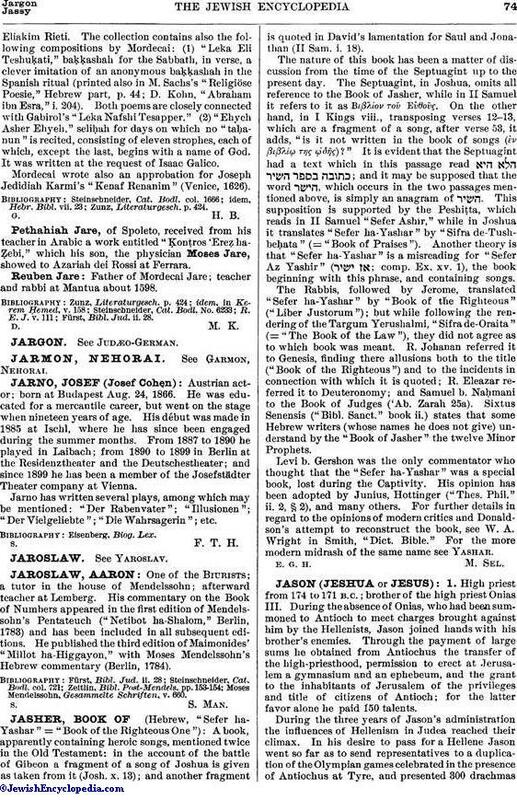 11 only Jason's companion, Eupolemus, son of John (or John, son of Eupolemus), is mentioned.G. S. Kr.